This giveaway is now over! Congrats to LeighAnn H and Tina Z, I’ll be messaging you on Facebook within a few minutes. If you’re a fan of our facebook page then you know every Friday we have Fan Appreciation where we do a giveaway. Well this week we have some special sponsors: The Brookie Cookie. 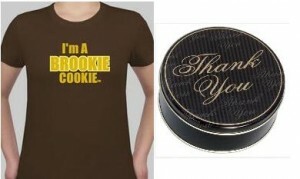 They’re generously giving away 1 “I’m A BROOKIE COOKIE” Tee-shirt with 1/2 dozen cookies and 1 “Thank You” cookie Tin. These are great gifts to give someone special for a job well done or just as a special “Thank You”! To enter this giveaway just Like the Brookie Cookie on Facebook here or follow them on twitter here. After you do, visit their website here and comment below with your favorite product they offer. We’ll pick 2 winners at random. Winners will be announced at 10:00 PM (ET) / 7:00 PM (PT) on December 3rd. i have not had cookies ever mailed to me but im thinking i might now..mmm..love cookies and those look GREAT! Brookie Cookie Double Chocolate – Can’t wait to try!!! I have never tried BROOKIE COOKIES before. They are made on East coast, and we live on West.Coast..They look so delicious, I am ordering the cnutty crunch, and vanilla creme by mail.. Salivating over the mint chocolate cookie…I love those!!!!! mmmmm the Brookie Creme Sandwich with the vanilla filling looks goooood! I would love to try the BROOKIE Sandwich (Creme)! My favorite is the brookie sandwich! My favorite? The Brookie sandwich (creme) .Anything with creme in the middle is yum! I love the BROOKIE double chocolate cookie!!!!!!!!!!!! OMG!! I want to try Christmas Brookie Cookie!!!! Oh this looks soooo yummy!!! I would love to try the Brookie Sandwich!!! mmmmmm…. And the penguin tin looks so cute!!! I don’t think I could pick just one fave! Thanks for the share of the website! Brookie cookies are to die for!!!!!!! The double chocolate cookies look amazing…I think they will be one of our favs!! the brookie double chocolate cookie looks amazing! I want to try the mint cookie!! I would have a really hard time choosing! I love the Brookie Sammich Creme, The BROOKIE COOKIE Christmas Limited Edition Mint Cookie, & The BROOKIE Double Chocolate Cookie! They all look yummy! BROOKIE double chocolate cookie (w/o nuts)! YUM! Love the Brookie cookie double chocolate, Happy Holidays. The double chocolate with nuts! Looks delicious! OMG…the BROOKIE Sandwich w/vanilla creme filling is just making my mouth water just looking at. I’m telling you I just gotta have one, I really do. Phewww….I’m calmed down now. That was really tough though. Sorry….it’s just so darn yummy looking, I just couldn’t control myself. I like the Brookie Cookie creme sandwich cookie. I would love to try the Brookie’s double chocolate cookie w/o nuts and the Christmas Limited Edition Mint Cookie. They all sound delicious! The BROOKIE COOKIE Creme Pie, mmmm~I never tried it but it looks & sounds gooood! The christmas limited edition Mint Cookie looks very yummy!!! yummo!! the Brookie Cookie Crunch!! BROOKIE COOKIE with NUTS mhhh!!! The Brookie Cookie Crunch. I love chocolate and pretzels together! Yum! I would love the Brookie sandwich! I liked in FB Malca Jamaya. Thanks! I love the Double chocolate w/o nuts or the sandwich cookie they look amazing! I would love to try the Brookie double chocolate cookie w/o nuts…OR the sandwich…mmmm. Any Brookie Cookie would be delicious to try! I like the Brookie Double Chocolate Cookie. Mmm, the Brookie Sandwich with the Creme is my favorite. By the way, I follow Brookie Cookie on Facebook. I have never had a Brookie cookie before but I sure would love to try one. I would like any cookie with nuts. BROKKIE DOUBLE CHOCLATE CHIP!MY FAVIORTE! This is a very cool site! I think that the chocolate with the Vanilla cream center looks like the best. I will have to order some. Definitely the Brookie Cookie Crunch! Double chocolate chip! I am addicted to chocolate! BROOKIE double chocolate cookie – with nuts! i think my 2 favs would be The BROOKIE COOKIE Crunch and probably The BROOKIE COOKIE Christmas Limited Edition Mint Cookie 🙂 how do u know who the winners r? this is my 1st time. I love the Double Chocolate-1 in each hand & one in my mouth ! Would love to try the holiday Mint Cookie-bet it’ll be my new addiction cause I have a mouth full of sweet teeth ! I would love to try the Limited Edition Mint cookie & the Double chocolate:) Everything looks delicious! im a broke cookie! 😉 love it! The brookie sandwich looks oh so srumpdelicious and the limited edition mint chocolate. BROOKIE double chocolate cookie… I may be a rookie but I thinks it’s the best!!!! I am torn between 3 of their cookies, but I am going to have to say the Brookie Cookie Crunch. And I LOVE their Penguin tin. So cute. I Havnt Got To Try Their Cookies Yet. But Id LOVE To!! They are all making my mouth water:) but the Mint ones sound YUMMY:)!!!! Love The Brookie Cookie Crunch..I bet every bit is worth the calories! The lil’ Brookie Cookie mini creme sandwiches or with nuts! mmmm the BROOKIE Sandwich with Creme, YUM! i would love try them. The Brookie Cookie Creme sandwich,slightly warmed and a scoop of vanilla ice cream,chocolate syrup,nuts,whipped cream and a cherry….now we’re talking!!! That cookie sounds good right about now. I would have to say the double chocolate cookie.. Talk about yummy!!!! Brookie Cookie Crunch! Nom nom! I like the …….Brookie Sandwich cookies…. I just want some..!!! waaaaaaaaaaaaahhhhhhhhhhhhhhh….look so yummy!!! Brookie Double Chocolate Cookie. Yum! Just did all of that. Thanks. I would love to try the BROOKIE Sandwich Creme cookie, They all look sooo very delicious ♥ I am a pastry chef , and work as a food stylist, so I will be telling my boss about this website. Oh yeah I love me some cookies!! Oh yeah I love me some cookies!! Double chocolate please! Brookie Cookie original with pecans AND almonds!!!!!!!!!! Would love to try and share! I have never tried Bookie Cookies before, but I would love to try them now, so any flavor would be great! Thanks samplestuff.com! Brookie Cookie Crunch! Pretzels and Chocolate, Yum Yum. The double chocolate cookie, YUM!!!!!! I really want the Brookie Cookie Crunch! It looks scrumdeliumptious! Brookie Double Chocolate Cookie with Pecans 😀 YUM!!!! The Brookie cookie looks GREAT! I am a fan of Brookie Cookie…And I think the regual brookie cookie with nuts sounds YUMMY! My favorite this time of year is the chocolate mint. But throughout the year it’s the cream sandwhiches all the way! My favorite is the BROOKIE double chocolate cookie with nuts!! I can’t wait to wear the cookie tshirt! I follow Brookie Cookie on FB and my fav is the BC Crunch!! BROOKIE double chocolate cookie (w/o nuts) sounds yummy!!! The BROOKIE Sandwich (Creme) looks AWESOME! YUM! Thank you so much for this chance to win. I love your web site and Love all the pretty tins you have for this wonderful holiday. I would love the chance to own one and try your product. Just want to say thank you again! GOOD LUCK EVERYONE AND HAPPY HOLIDAYS! My daughter’s name is Brooke and I call her Brookie Cookie so I would love to win the t-shirt for her! The chocolate mint cookies look awesome but so does everything else!!! Thanks sooooooooo much! The BROOKIE double chocolate cookie. Yummy! This is first I’ve heard of them….but all choices look amazing!!! I’d like to try to find out if they are as good as they look. Ahhhh SOOKIE SOOKIE … I would LOVE a Brookie Double Chocolate Cookie !!!!! THANKS and MERRY CHRISTMAS !!!! LOVE the BROOKIE COOKIE Christmas Limited Edition Mint Cookie! I like the The BROOKIE COOKIE Crunch! Love pretzels and chocolate! Chocolate Mint, Yum Yum ! The Brookie Cookie Crunch looks delicious!!! The brookie cookie crunch looks very very yummy! Brookie Dooble Chocolate Cookie…. YUM! WOW, THE BROOKIE double chocolate cookie (w/o nuts) looks truly decadant. I like the brookie creme sandwich! I LOVE The Brookie Cookie Double Chocolate Cookie With Nuts!!!! My favorite is Crunch and Christmas Limited! i just drooled all over my desk cuz of the BROOKIE CREME SANDWICHES!!! yummmmm!!!! The double chocolate sounds great!!! How could you not fall for the Brookie Creme Sandwich? The cookies are wrapped around the vanilla creme just oozing out the sides. I hope I can get some of those for Christmas. A few of those with some eggnog or hot chocolate would do it for me.. The Brookie Sandwich looks amazing!! Would love to try it! The vanilla cream Brookie cookies are to die for!!! YUM!!!!!!!!!! They once sent me a sample of the BROOKIE double chocolate cookie. It was delicious! Brookie Cookie Sandwich Creme has to be the very best! Wow!! The Brookie Creme Pie looks sooooo delish!! Double Chocolate is my favotite. I like the Brookie Cookie Crunch the best!!! I would love to try the Brookie Cookie Crunch. It looks so delicious! My son who is in college did a blog for the school about Brookie Cookies. I would like to know where to find them. He is in TN, I am in NC… he said they are great, and that means there is something at least equal to mine. That is a good thing … my son knows quality and so I am interested in winning a tin and cookies… Brookie Double Chocolate sounds tempting, so does the limited time peppermint. OMG, this is crazy!!!! I have a 16 month old daughter named Brooke and we call her Brookie Cookie, lol!!! My husband is from Brooklyn and our daughter’s full name is Brooke Lynn – this is just too coincidental….I must win! No matter what, thanks for turning us onto your products – we are totally ordering some tins for the holidays. Death by creme sandwich is all I can say! BROOKIE double chocolate cookie ( with nuts of course!)!! BROOKIE double chocolate cookie, yummy! OMG!! I love love the mint cookies!!! YUM!!!! The christmas mint cookie!!!! mmm looks delicioso!!!! I like the limited edition Christmas mint cookies they are the bomb!!!!!!!! I love the limited edition cookie with the candy canes! YUM YUM!!!! The limited edition Christmas cookie! I’d like the chocolate mint with the candy cane on it. would be wonderful to share with my children. I like the chocolate cream cookies. WOW, they all look delicious, I’d love to have one or two of each one!! But if I had to pick just one I’d love to try the Christmas limited edition mint cookie, I love chocolate mint. I have not tried these cookies but if I had to choose it would have to be brookie double chocolate cookie with nuts. Wishing I had some to taste. double chocolate nut cookies, and yummy cookies 🙂 I love the tee shirt. Hope I win!